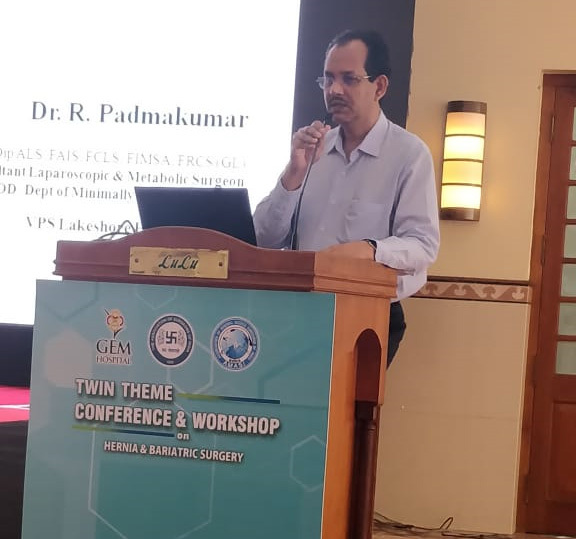 Dr. R. Padmakumar as faculty at conference/workshop held by GEM Hospital and Research Center, Thrissur, on April 6 and 7, 2019. Dr. Padmakumar spoke on the topic of “Bariatric and Metabolic Surgery: Options”. 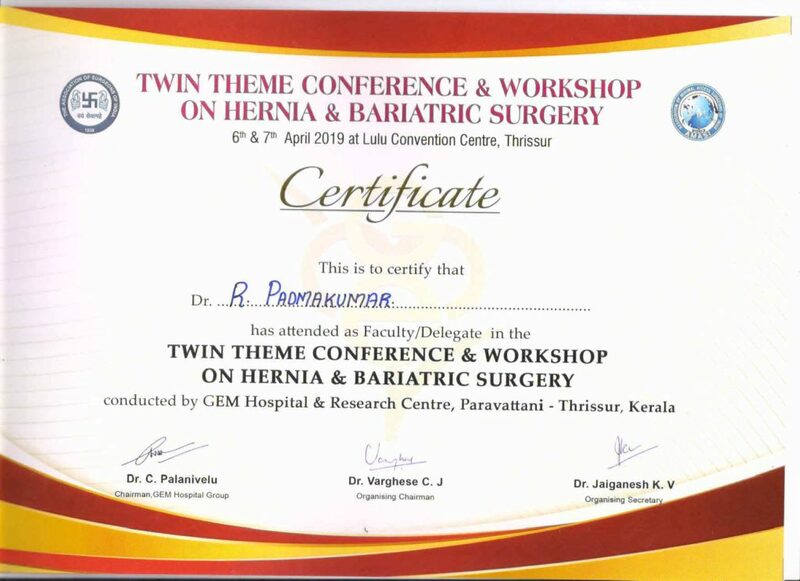 As part of continuing medical education programme and campaign towards excellence in Minimal Access Surgery, this conference was conducted as a Twin Theme Conference/Workshop on Hernia and Bariatric Surgery on April 6th and 7th 2019 and held at Lulu Convention Centre Thrissur. 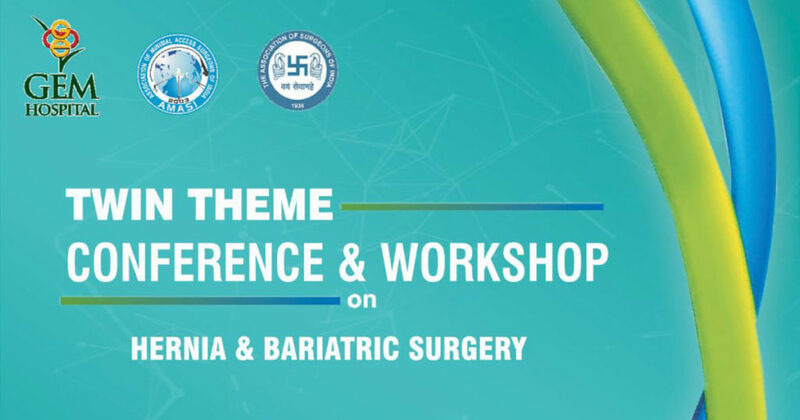 The conference focused on two core areas of minimal access surgery – Hernia Surgery and Bariatric Surgery, which are undergoing rapid changes. Bariatrics is the branch of medicine that deals with obesity, the causes, prevention and treatment of obesity. Bariatric Surgery is considered in people struggling with severe obesity. Metabolic Surgery is the term used to describe treatments and procedures for weight loss to treat metabolic diseases, especially, type 2 diabetes. Obesity is considered a major risk factor for type 2 diabetes mellitus (T2DM). Intragastric Balloon Placement is a non-invasive procedure for weight loss. Dr Padmakumar as Operating Faculty at the Govt. Medical College Kozhikode demonstrating Laparoscopic Hernia Surgeries. PSG IMS&R – Demonstration and lectures on Endoscopic Thyroidectomy at PSG IMS&R by Dr. R. Padmakumar. PSG Institute of Medical Sciences and Research is a teaching hospital and research institute. It is located in Peelamedu, Coimbatore. Banaras Hindu University – Dr. Padmakumar as Operating Faculty for Endoscopic Thyroidectomy at BHU Varanasi (Banaras Hindu University). Banaras Hindu University is a public central university located in Varanasi, Uttar Pradesh. It claims the title of largest residential university in Asia. Sultan Qaboos University – Sultan Qaboos University – Dr. Padmakumar as Faculty at Sultan Qaboos University. Sultan Qaboos University is located in Al Khoudh in the Muscat Governorate and it is the only public university in the Sultanate of Oman.